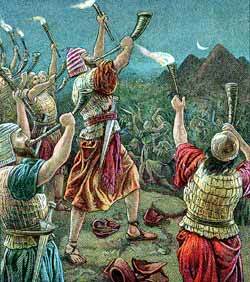 Gideon’s three hundred men blow their trumpets. THE CHILDREN OFIsrael did evil in the sight of the Lord; and the Lord delivered them into the hand of Midian for seven years. The Israelites took refuge in dens and strongholds in the mountains, and in caves. At harvest time, when the crops which had been sown by the Israelites were ready for the reaping, the Midianites came with their numbers of camels and ate up the crops. They were in great numbers like grasshoppers, and when they left, the land was bare, with no food for man or beast. The children of Israel cried out to God and wanted to know why this great trouble had come upon them, and He sent them a prophet to tell them that it was because He had brought them up out of Egypt, and had delivered them from all oppression, and He had told them not to worship the gods of the country in which they lived, for He was the Lord their God; but they had not obeyed Him, and for this they were being punished. So the next day Gideon took ten of his servants and went up to the hill on which had been erected an altar to Baal and the Asherah, the false gods whom the people were worshiping. He threw down the false altars, and built an altar to God in the same place, and on it he made a burnt offering to God. The next morning when the people saw what had been done, they cried out to one another. “Who has done this thing?” they shouted. Then the men of the city went to Joash, Gideon’s father, and they asked him to send his son out, that he might be put to death. And God did so that night. Then Gideon returned to his army, and prepared for the battle. But Jehovah said that his army was far too large, and he asked Gideon to send home all who were fearful and afraid. So twenty-two thousand went home, and then thousand remained. But Jehovah said that it was still too large, and sent home all but three hundred. That night Gideon went alone to the camp of the Midianites, and he heard one man telling of a strange dream. Gideon returned to his camp. The Midianites were in utter confusion, and Gideon won an easy victory. This entry was posted in Discipleship and tagged Gideon, God, Israel, Israelite, Jehovah, Lord, Midian, Midianite, Old Testament, theology. Bookmark the permalink.